so I can describe no more.. 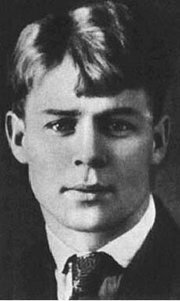 POET SERGEI ALEKSANDROVICH YESENIN WAS BORN IN KONSTANTINOVO ,RUSSIA ON 03 OCTOBER, 1895 AND DIED IN ST.PETERSBURG ON 27 DECEMBER 1925. HIS LIFE WAS FILLED WITH DEEP EMOTIONAL TURMOIL COMPOUNDED BY HEAVY ALCOHOL ADDICTION.HE WAS BRIEFLY MARRIED TO THE FAMOUS DANCER ISADORA DUNCAN. UPON FIRST MEETING HIM,DUNCAN SAID SHE HAS NEVER SEEN A POET WHO IS AS BEAUTIFUL AS HIS POEMS.KONSTANTINOVO, HIS BIRTHPLACE ,IS NOW KNOWN AS YESENIN (RENAMED AFTER ITS MOST FAMOUS SON).